How about using a cylindrical brush (like a bottle brush) on a rotating shaft. Then as the poly accumulated and cooled the brush could turn and a beveled metal edge could scrape off the deposits from below into a recycle bin. It looks like PCL must be a lot stickier than HDPE. The toothbrush version always clears my nozzle and the HDPE does not stick to it. The only problem I do have is that the nozzle is hot enough to melt the bristles to it is slowly going bald. Run a small amperage through the blade to heat it enough that the poly melts and drips off. It doesnt even need to be monitered - experimentation will show the right amount of trickle current to be left on. You could spring load an exacto blade underneath the scraper next to the V notch. 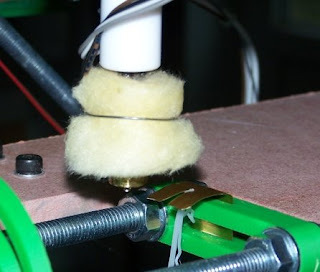 The nozzle (or an arm attached to the nozzle) would push it out of the way and then after the nozzle moves away the spring would push the blade back over to slice off the deposit of plastic filament. > bristles to it is slowly going bald. Yes - I had that problem with a toothbrush too. Tree-hugging types brush their teeth using toothbrushes with real bristles from dead things in, as opposed to nasty chemical polymer bristles. I suspect they'd go up to higher temperatures. Great minds etc. That's exactly what I did. See the later blog for 17 March.